To install the male header on the Front Panel, Insert the male 30 pin header from the top of the board so the long part goes through the board. Mate the long part of the pin with a female header – either on the CPU Board or loose. Starting at one end, push the metal pin further through the plastic body to make sure it fully seats in the female header. 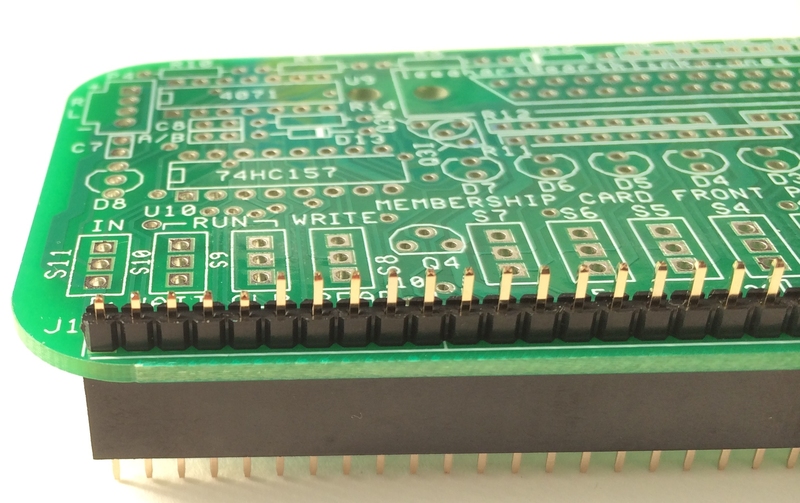 You should end up with a full 1/4″ projecting below the board and very little pin above the black body. In the picture below the first few pins on the left have been pushed down but not the rest. Solder from the bottom. Don`t use too much solder. There is no need to cut off the part of the header that sticks up above the Front Panel Board and you may find these are handy test points. Note: If you`re not concerned about fitting the cpu board and front panel assembly into an altoids tin I would recommend that you install the male header from the bottom of the board with the long part down and the plastic body below the board. There is no need to adjust the pins in this case and you would solder from the top.